Milk Chocolate Digestive Biscuit Base, Cadbury's Heroes Chocolate Cheesecake Filling, and all the Cadbury's Heroes goodness on top! Blitz your biscuits to a fine crumb using a food processor, or a bowl with the end of a rolling pin. Melt your butter to liquid, and then mix in with the Biscuits. Press into the bottom of an 8"/20cm Deep Springform Tin. Chill the base for 20 minutes. Melt the Two Chocolates together until smooth. Whip together the Cream Cheese and Icing Sugar until smooth. Add in the Melted Chocolate and whip till combined. Add in the Double Cream, and whisk till thick! Mix with the spatula to make sure its all smooth and combined, and then add in some chopped Heroes and stir through. Spread onto the biscuit base, and leave to set in the fridge for 5-6 hours, or preferably overnight! Melt together the Dark Chocolate and Double Cream in short bursts in the microwave. Stir till smooth! 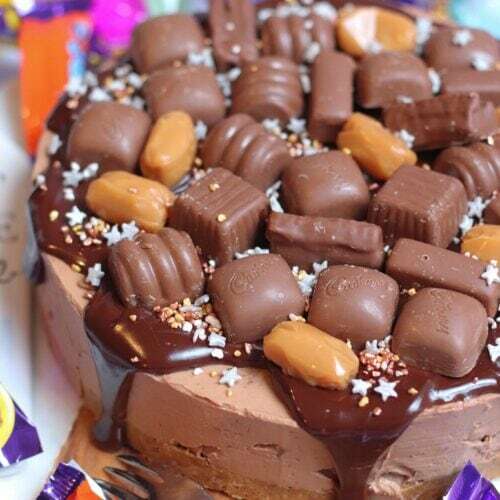 Spread and drip the Ganache over the top and sides of the cheesecake, and add on some Cadbury's Heroes! Sprinkle on your favourite sprinkles, and enjoy! You can make the cheesecake in advance and freeze before decoration, just make sure to set it fully first before freezing. You can find the delicious ingredients in all Costcutter Stores this Christmas! This post was sponsored by Costcutter Stores.